Lots of mud volcanoes in Gobustan, Azerbaijan. A mud volcano or mud dome is a kind of volcano that is made by liquids and gases from the earth. There are many different ways that mud volcanoes can be made. Temperatures in a mud volcano are much cooler than that of a regular volcano. The biggest mud volcanoes are 10 kilometers in diameter and can be as tall as 700 meters.[source?] Most of the gases given off by mud volcanoes are methane. Other gases given off include carbon dioxide and methane. They usually spit out liquids with solids in the liquids. An example of this would be water with salt or acids in the water. A mud volcano is usually made by mud diapir that breaks out of the surface of the Earth or on the ocean bottom. Temperatures in mud volcanoes can be as low as the freezing point. Mud volcanoes are often linked with places where petroleum gathers and around areas of tectonic subduction. They can also be linked with orogenic belts where hydrocarbon gases usually erupt. They are also often linked with lava volcanoes as well. However, instead of spitting out magma, mud volcanoes spit out gases like methane and carbon dioxide. Around 1,100 mud volcanoes have been found on land and in shallow water. People think that more than 10,000 mud volcanoes may exist on continental slopes and abyssal plains. There are many features of mud volcanoes. One of these features is the gryphon, which is a steep, short cone that gives off mud. Another feature is the mud cone, which is a tall cone that makes mud and small pieces of rock. The scoria cone is a cone that is made when deposits of mud are heated up and the salse, which are pools of water that leak gases out of them. Mud volcanoes have many other features, but most of these are notable. Most of the things that mud volcanoes spit out happen during volcanic eruptions. Other eruptions have been known to happen during the time when a volcano is dormant or sleeping. There are very few mud volcanoes in Europe, but quite a few are on the Taman Peninsula of Russia and the Kerch Peninsula in the southeastern part of Ukraine. In Italy, many mud volcanoes are near the Apennines and in Sicily. Also in Europe are the Berca Mud Volcanoes, near Berca in Buzău County, Romania. Many mud volcanoes are by the Black Sea and Caspian Sea. Movement from tectonic plates have made areas of mod volcanoes that spit out hydrocarbons and methane. 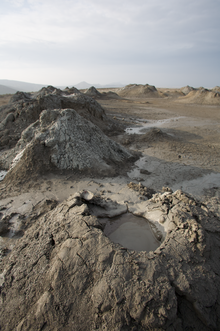 Some of the tallest mud volcanoes are in Azerbaijan. Mud volcanoes are also in Iran and Pakistan in the Makran mountain range. China has a lot of mud volcanoes in the Xinjiang province. There are two active mud volcanoes in the southern part of Taiwan. The island of Baratang, which is part of the Great Andaman group of islands in the Andaman Islands, Indian Ocean also have a few active mud volcanoes. People think that 300 of the mud volcanoes out of the 700 mud volcanoes on Earth are in the eastern part of Azerbaijan and the Caspian Sea. In 2001, one mud volcano about 15 kilometers away from Baku was in the world news when it suddenly started spitting out flames 15 meters high. This page was last changed on 20 January 2018, at 04:35.